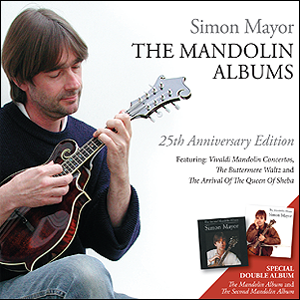 A special 25th anniversary double album reissue of Simon Mayor's first two solo albums The Mandolin Album (1990) and The Second Mandolin Album (1991) - remastered and with comprehensive sleevenotes. Sparkling originals and inventive adaptations of the classics from one of the world's leading mandolin virtuosos. Featuring the mandolin, mandola and mandocello. Tracks include Vivaldi's Concerto for Mandolin and Concerto for Two Mandolins, Handel's The Arrival of the Queen of Sheba, and Simon's own much requested The Buttermere Waltz.